Bespoke IT solutions to help your business run smoothly, quickly and securely. Achieve 100% peace of mind with virus protection and data recovery. Our friendly team of IT experts offer a comprehensive range of tailored business IT services, designed to help your company run efficiently and productively. This includes ensuring your network is secure, fast and fully backed-up. Achieve a proactive approach to IT services that allow you to concentrate on the work at hand, with all the tools you require running smoothly. Our aim is to deliver tailored systems that work for your needs and offer you 100% peace of mind. Call us on 01403 290 321 or 01293 912 321 to discuss your current setup and requirements. After an initial consultation we can begin the process of streamlining and improving your IT systems to better suit your business. 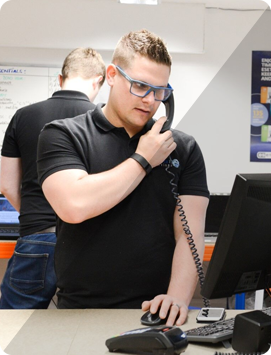 Our tailored approach means you’ll always have enough memory for cloud-based solutions and should the worst happen with your hardware, we can provide temporary machines to keep you productive at all times. In addition, our wireless network services will ensure you’re connected and secure and through backup solutions and data recovery, you won’t have to worry about losing important documents. If we can’t offer you a solution or fix your issue, then you won’t be charged. In the unlikely event we cannot diagnose or complete a fix, we’re more than happy to let you know what we’ve found through our diagnostics and point you in the right direction. In this way, you’ll still be able to move forward with your issue and get our expert insight at no cost. If you have a query, don’t hesitate to get in touch. We look forward to hearing from you.